Sizeable 3 carat moissanite stud earrings set in 14k white gold with 3-prong martini posts. 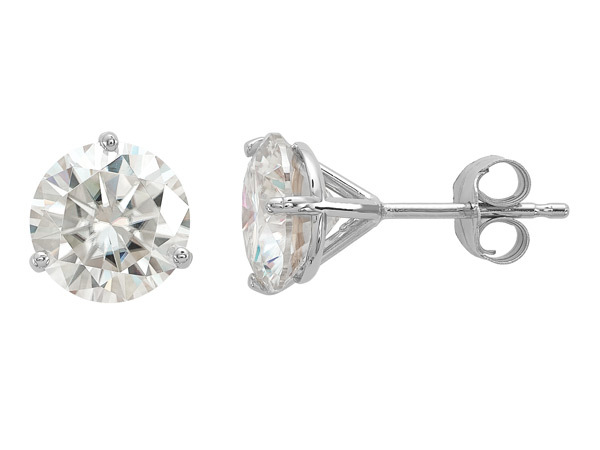 Each stud earring houses a 1.45 carat moissanite stone for actual total carat weight of 2.90 carats for the pair. The 3 carat moissanite studs are handset in the U.S.A., so please allow approx. 4-5 business days before shipping. Each moissanite stone measures 7.5mm round in size. Also available in 1 or 2 carat sizes, shown below. These earrings come with secure, friction-post push-back closures. We guarantee our 3 Carat Moissanite Stud Earrings in 14K White Gold with Martini Posts to be high quality, authentic jewelry, as described above.